Stiff competition from its neighbors and growing deficits are threatening to thwart Hungary’s attempts to attract inward investment, but the country’s development agencies are fighting back. Two years after its historic entry into the European Union (EU), Hungary presents a mixed picture of economic strength combined with uncertain financial conditions. On the one hand, this nation of 10 million people is reaping the trade and investment benefits of EU membership, producing strong and steady GDP growth and attracting foreign direct and venture capital investment. On the other hand, concerns persist over the nation’s ballooning budget and current account deficits, its ability to meet standards for adopting the euro as its currency and its capacity to compete with fast-growing, emerging economic rivals elsewhere in central and eastern Europe. The growth figures are steady, if not spectacular. 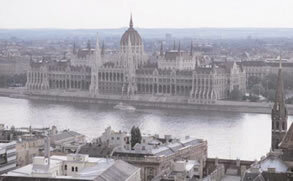 In the fourth quarter of last year, Hungary’s GDP was 4.2% higher than the same period in 2004. For the full-year 2005, GDP rose 4.1%, matching the country’s average GDP growth rate between 2001 and 2005, according to Eurostat, the EC’s statistical office. While Hungary’s GDP growth trounces Poland’s, which registered 2.6% growth in 2005, it trails both the Czech Republic and Slovakia, both of which posted 6% GDP growth last year and 4.7% and 5.5% growth in 2004, respectively. Hungary can take comfort, however, in that it has one of the emerging markets’ principal bogeys, unemployment, under control. Hungary’s 7.6% unemployment rate in February was less than half the 17% rate seen in Poland and the 15.8% in Slovakia that month, Eurostat reports. It was also lower than the rate for the Czech Republic (6.7%), European Union (8.5%) and the euro area (8%). 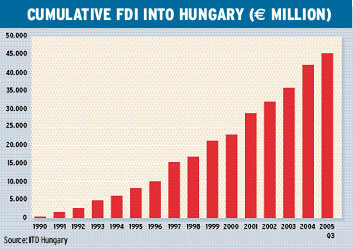 Since its transition to a market-driven economy began more than 15 years ago, Hungary has attracted roughly E50 billion in foreign direct investment (FDI), according to Hungary’s Investment and Trade Development agency (ITD Hungary). Business services and automobile manufacturing are the two sectors that have received the most FDI, according to the National Bank of Hungary. Since the early 1990s, Audi, General Motors, Suzuki and many of their parts suppliers have set up facilities in the country. Privatization is also sucking in investment. Last December, in Hungary’s biggest privatization deal ever, Britain’s airports operator BAA acquired a majority stake in Budapest’s Ferihegy Airport for 464.5 billion forints ($2.2 billion). BAA, which also operates London’s Heathrow and Gatwick airports, acquired from APV Rt, Hungary’s state privatization company, a 75% stake in Ferihegy and a 75-year operating license. BAA reportedly beat out two consortiums led by German firms Hochtief and Fraport for the airport stake. The UK firm also agreed to invest another 65 billion forints (nearly $300 million) in the airport between 2006 and 2011. At the time of the deal, BAA said it could increase passenger traffic at the capital city’s airport to 20 million by 2020 from 8 million in 2005, driven by growth in tourism, budget-airline services and the economy overall. In the deal, BAA also received the option to purchase the government’s remaining stake in the airport for 20 billion forints ($95.1 million), with the price increasing 11.5% every year. As well as selling off state-owned assets, Hungary is stumping up hard cash to promote the expansion of existing businesses. In March, for example, St. Louis–based Zoltek announced that the Hungarian government would give it 29 billion forints to expand its factory 30 miles west of Budapest to become the world’s biggest carbon-fiber production facility. Zoltek, which employs about 800 people worldwide and generated $60 million in revenue last fiscal year, says it will add 600 new employees in Hungary over the next few years and expand its production capacity there from 800 tons to 8,000 tons per year. “This grant is a critical element supporting modernization and expansion of the facility. We believe that our Hungarian plant, in turn, will play a leading role in the production of carbon fibers used in commercial and industrial applications in European and world markets,” says Zsolt Rumy, Zoltek’s founder, chairman, president and CEO. The company is developing carbon fibers for a variety of recently developed applications, including wind energy, ultra-deepwater drilling, the creation of strong but concrete structures and a new generation of fuel-efficient cars. Deals such as the government’s grant to Zoltek are becoming more commonplace in Hungary’s campaign to grow its economy as the nation focuses more on the introduction of advanced technologies and innovation into production of goods and less on pure privatization, according to ITD Hungary. ITD credits several attributes for attracting foreign investment, among them the nation’s location in the heart of Europe, GDP growth, business-friendly incentives, EU investment incentives, its skilled and productive work force, a strong presence of foreign and multinational companies and a developed logistical, transportation and communications infrastructure. It’s not all plain sailing, however. Hungary’s burgeoning budget deficit is spooking investors, analysts and government officials at home and abroad. In April Hungary’s finance ministry reported preliminary figures showing that the government finished March with a consolidated deficit of 353.7 billion forints, the highest ever and more than 30% higher than the finance ministry’s previous forecast of 262.5 billion forints. Through the first quarter of the year, the state deficit already surpassed half of the country’s annual target. The government blamed the higher-than-expected deficit on one-off expenditures, such as payments to pensioners, and expenditures for the accelerated implementation of EU-supported projects for which the Hungary central budget pays in advance and is later reimbursed by the EU. However, Hungary has consistently missed budget-deficit targets over the past four years. Hungary’s current account deficit presents a better picture. In the fourth quarter of 2005 it was lower than expected, declining to nearly E1.5 billion from E1.7 billion a year earlier. The full-year 2005 current-account deficit narrowed to E6.4 billion or 7.3% of GDP, from 8.6% of GDP in 2004, boosted by improvement in the trade deficit. But some analysts say the deficit could again balloon this year. Nóra Szentiványi, an economist with JPMorgan Chase in London, predicts that the current-account deficit will widen to about 8.5% of GDP in 2006, boosted by “fiscal expansion and rising capital goods imports.” If that prediction is correct, Hungary will be hoping that its heavy outlay to encourage investment starts to show growing returns. If not, investors might begin to look elsewhere.